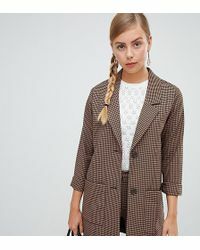 The brainchild of three friends, Swedish brand Monki expertly mixes the latest trends with understated, wearable designs. Founded in 2005, fun store concepts and quirky, design-led collections have made Monki the go-to brand for those in the know. Expert at engaging with their fan base, who are referred to as "Monki friends", the brand has spun an entirely fantastical story based around playful, fantastical creatures, making Monki World a undeniably fun place to spend some time. Bold prints, vivid colour, crop tops and eye-catching pattern mix with more muted staples, perfect for building a stylish closet with personality and expression.